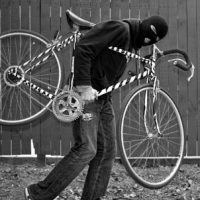 This would-be bicycle thief appears to be a few spokes short of a wheel. Adam Valle is accused of trying to steal a locked two-wheeler right in front of a sign for the police department in Gladstone, Oregon, while cops inside watched on a surveillance camera. The Associated Press’s edited video, below, shows the hoodie-wearing suspect approach the bike with bolt cutters, which he uses to clip off the lock before he’s caught in the act by an officer with a stun gun, according to the Gladstone PD’s Facebook page. “Suspect arrested for attempting to steal a bike…From the PD!!! !” the police Facebook caption says.